JEECE 2019: Jharkhand Engineering Entrance Competitive Examination (JEECE) organized by Jharkhand Combined Entrance Competitive Examination Board (JCECEB). This exam is started from the year 2017 for providing admission into engineering courses separately by Jharkhand government. To get admission into various streams of BE/ BTech, students have to fill the JEECE application form. Candidates who will submit their application form successfully and pay the fee before the last date, will be able to download the admit card for the exam. The exam will be held in the month of May and the official authority of JCECEB will declare the results after 10 to 15 days. JEECE Entrance Exam will be held at state level and only for candidates who belong to Jharkhand state. All interested candidates who wish to take admission into BE/ BTech programmes in government & private engineering colleges of Jharkhand state can appear in this exam. Here we have mentioned all the details related to the exam such as JEECE exam dates, eligibility criteria, result, cutoff etc. Here we have listed the eligibility criteria of JEECE entrance examination, which will be held in the year 2019 for admission into engineering & technology courses for the academic session 2019-2020. Candidates have to ensure all JEECE Eligibility Criteria before applying for the form. He/ She should have Indian Nationality. Candidates must have domicile of Jharkhand state. No minimum/ no maximum age criteria will be for JEECE exam. Should have scored minimum 45% aggregate in PCM subjects together in class 12th. 5% relaxation for reserved category will be provided. Candidates have completed his senior secondary education from any recognized board or Jharkhand board can apply for JEECE. To appear in the JEECE examination, candidates have to apply online application form. JEECE Application Form will be available on the JCECEB official website. Candidates who want to get admission into state colleges of Jharkhand can register themselves and must submit the form before the last date of form submission. Go to the official site of JCECE board i.e. jceceb.jharkhand.gov.in. 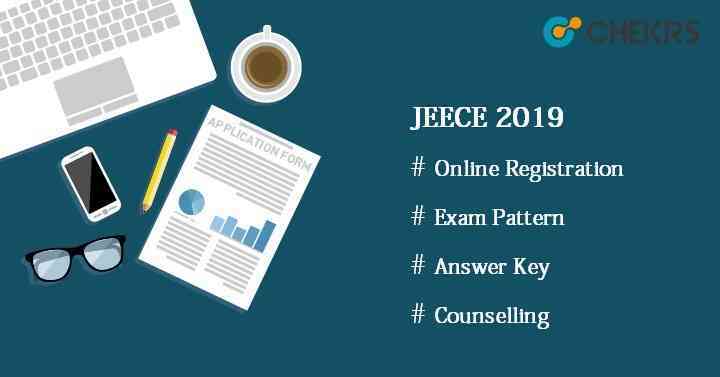 Click on the link “Online Application for JEECE -2019” available on the home page. Fill the all empty field with correct information. Upload the scanned images and relevant documents if needed. Pay the application fee through payment gate method via Credit card/ Debit card/ Net Banking. The syllabus of JEECE exam will be same as the syllabus of class 11th & 12th prescribed by CBSE. JEECE Syllabus will be decided by the JCECEB authority. The questions will be asked from all the topics included in Physics, Chemistry & Mathematics subjects. Candidates are advised to go through all the topics of PCM. Candidates are advised to practice more & more previous year question paper to improve their efficiency & speed. JEECE Sample Paper will give the overview of JEECE exam paper. With the help of previous year paper, candidates will know the exam pattern. It will give an idea about the exam pattern, type of questions asked, level of questions asked in exam, marking schemas etc. Make a time-table and follow it strictly. Give time to each subject equally. Make short notes, write formulas & chemical reaction and revise them on regular basis. Take small breaks between continuous studies. Solve the previous year paper on daily basis. Give mock test to increase your speed and efficiency. JEECE exam will be held in the month of May. Before the examination date, JCECEB will upload the admit card on its official portal. Applicants, who will submit their application form successfully, will be able to download the JEECE Admit Card. It will be mandatory to carry the admit card while appearing for the exam. Visit the official site of JCECEB. Go to the “Admit Card” tab. Click on it. Enter application form number or candidate’s name. The Answer key will be released within 3 or 4 days after conducting the examination successfully. JCECEB will upload JEECE Answer Key on its official site for every set of paper. Candidates can match their answer with the released answer key and can estimate their score in the exam. Even, students can also claim or object against the wrong answer before the last date through online mode only. Visit the official site i.e. jceceb.jharkhand.gov.in. Go to the “Result” option present at the top of the home page. Select the name of examination. After this, enter your examination roll no and click on “Search” button. JEECE Result 2019 will appear on the screen. Save it for future use. Along with the results, JCECEB will also release the cutoff on its official website. JEECE Cutoff will be minimum required percentile or marks obtained by the candidates in the examination. To get qualified in JEECE exam, candidates have to score the cutoff marks. It depends on various factors like previous year cutoff marks, difficulty level of paper, seats availability, reservation criteria etc. Candidates scoring more than or equal to cutoff marks will be called for next procedure i.e. counselling round. Last round will be counselling for admission into engineering colleges of Jharkhand state. JEECE Counselling will be conducted through online mode by JCECEB. Counselling will be performed in 2 rounds. First round will be held for qualified candidates and second round will be for the vacant seats after the admission of candidates who appeared in first round counselling. Candidates will be called for counselling on the basis of marks & rank secured in the JEECE Exam. To participate in the JEECE Seat Allotment process, Candidates have to pay the counselling fee or registration fee and to show the original, relevant documents for verification. Applicants have to fill the choice form for selection of colleges & streams. On the basis of document verification and seats availability, seats will be allotted to the candidates.